Black sea, bright sun, renewed Potemkin staircase, green slopes, restaurants on the main street – Deribasovskaya, one of the most beautiful theaters in the world – no, this is not Paradise, it is Odessa! And here are six reasons for you to visit this city in summer. Have you ever seen a city look so beautiful from a height? Not a city, but a park. Odessa Health Road stretches along the whole coastline, planted with greenery, equipped with benches, pedestrian and bicycle paths, sports grounds. You can easily get to the beaches if you made a decision to walk on the Health Road. The sea in Odessa is warm and clean. The beaches in Odessa are sandy and they continuously stretch along the entire seashore. In Odessa, wherever you go, you’ll find yourself on a comfortable beach with cafes, snack bars, hot sand and beautiful girls. Of course, if on the contrary, you need privacy, then you will find such beaches too – you only need to ask. You will get a great excitement from our architecture and color of Odessa courtyards. All sorts of architectural styles are mixed in Odessa, in some parts it looks like France, and in other parts like Italy or Greece. Almost all the buildings in the historical center of Odessa are architectural monuments, which are protected by law. Odessa still has buildings that remember famous Russian poet Alexander Pushkin, walking along the first streets of the city. 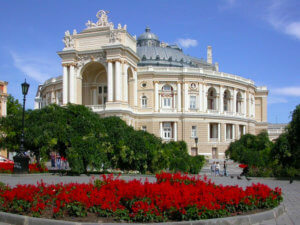 And one of the most famous symbols of the city – Odessa Opera House – is considered one of the most beautiful in the world. 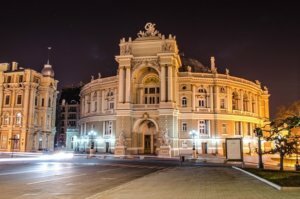 In 2008 Forbes magazine included the Odessa Opera and Ballet Theater in the list of the most interesting sights of Europe. Some people call it the 8th Miracle of the World. The Potemkin Stairs, or Potemkin Steps, is a giant stairway in Odessa, Ukraine. The stairs are considered a formal entrance into the city from the direction of the sea and are the best known symbol of Odessa. Monument to Duke de Richelieu – this monument is the first monument in Odessa, it faces the sea, directly in front of it the Potemkin Stairs leading to the Sea Port. Monument to the poet A. Pushkin who lived and worked in Odessa for 13 months. This is the third monument that appeared in the city. Monument to the founders of the city of Odessa. The memorial is dedicated to Catherine the Great and her companions – de Ribas, de Volan, Potemkin and Zubov. In 1920, the monument was dismantled, but thanks to local authorities and citizens it was restored in 2007. Sculptural group “Laocoon”. The artifact is an exact copy of the famous sculpture “Laocoon and its sons”, established in the Vatican. Despite the fact that today the sculpture is an ornament of the Odessa Archaeological Museum, originally it was created by order of a large Odessa entrepreneur (later – mayor of Odessa) G. G. Marazli to decorate his dacha (summer house). The colonnade with a view to the sea, a house with one wall, catacombs and parks, this is only a small part of what can be seen in Odessa. It is in Odessa, you can visit restaurants with an amazing sea view. Sushi bars, art cafes, where besides food, you can drink coffee and listen to a lecture on art, Odessa cuisine, meat, fish and vegetarian restaurants, hand-made confectioneries – for every taste and income. But, most importantly, you can try the real Odessa cuisine: forshmak, a Jewish snack (if you do not know what it is, rather go to Odessa to try), stuffed fish, fried flounder and gobies, Black Sea mussels, “blue” caviar (that is how Odessa people call eggplant caviar). You can try many interesting things not only in restaurants – Odessa “Privoz” is where you have to go! It’s the biggest food market in Ukraine. The lowest prices, the most special sellers and a huge variety of food can be found here. You can buy fresh flatfish only from the Black Sea and cook it, moreover, after bargaining with you, the saleswoman will tell you the best recipe of cooking, which is not known in any restaurant. The most popular summer place in Odessa is Arcadia. It’s not just a beach, but a huge number of nightclubs too. Every night the music plays in “Arcadia” and the most beautiful Ukrainian ladies come to dance. Here, the clubs for every taste and with very different prices are stretched along the seashore. You can go to adult shows at the club “Western” or to a concert in Ibiza club. This is a real center of night life, where you can go all night from one pub to another, and meet an unforgettable sunrise on the beach in the morning. Of course, there are nightclubs in your city or country too, but can you dip into the sea from the dance floor? In the afternoon Arkadia falls asleep and those who love daylight hours wake up. You can enjoy Victory Park (Park Pobedy) with the large lakes and boats or Shevchenko Park, where you can find a quiet place to rest. Only in Odessa you can ride on the biggest ferris wheel in Ukraine, a dozen different carousels for different ages. Here you can also shoot in the dash, buy sweet cotton wool and go down to Lanzheron beach, where you will find a Dolphinarium, Rope Park and sea kayaking. Only in Odessa several festivals are arranged every weekend. This is where hundreds of stylish people walk around the streets, bikers come to the “Goblin Show” to arrange a rock concert, it’s here in Potemkin Stairs we launch thousands of balls into the sky and eat to the dump at “Tsimes” market. Only our food has been devoted to three festivals, which take place several times a season. And, of course, only in Odessa you can get to the biggest film festival in Ukraine – the Odessa International Film Festival. And even if you do not get to the paid shows, you will have unforgettable night movie watching in the open air on the Potemkin Stairs or Lanzheronovskiy descent. The last but the main reason to come to Odessa is Odessa ladies. 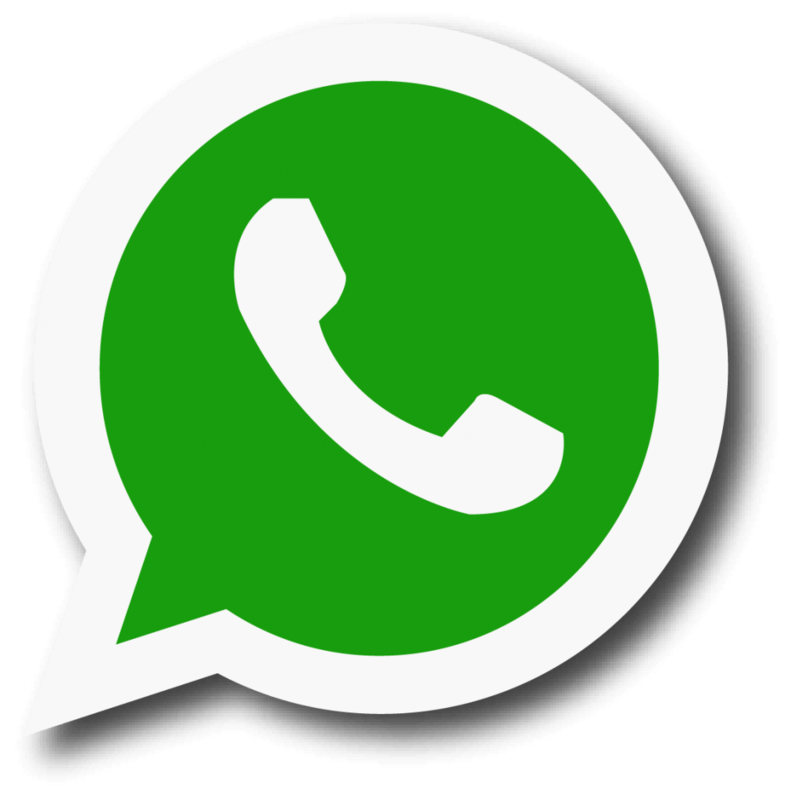 They are the most cheerful, hospitable, free-thinking and open. Only Odessa people will not only show you how to get to the railway station, but also tell ten funny stories, and then invite home to try the real Odessa cuisine. They are special people, soaked in salty sea air and the southern sun. Odessa girls are considered the most beautiful Ukrainian ladies in the world. This conclusion was made, independently of each other, by researchers from Europe and the United States. According to their reviews, Western men who seek a wife abroad, first of all look at the profiles of Odessa citizens. According to European and American men opinion, women from Odessa have a lot of advantages comparing to females from other cities. The natural beauty of women from Odessa comes from the special conditions of their residence and historical factors. Most of the citizens of Odessa have multinational roots, because in this city dozens of different nations lived for thousands of years: Romans, Greeks, Jews, Scythians, Slavs, etc. and the rich gene pool affects not only the level of health, but also the appearance. In addition, the Black Sea coast is a special natural environment that allows to preserve the female beauty nature. It is believed that Odessa women keep the ideal shape longer; they are less inclined to cellulite and being fat. Of course, all this is a theory, because you can’t calculate how many beautiful girls in Odessa and compare the data with other cities. However, the fact that men give preference to the women from Odessa is a fact! Just think about how many you can miss without visiting Odessa. You will not try a real foreshmak and fried mussels on the beach; you will not see the most beautiful Opera House inside. And one more thing, such people like the Russian emperors and Pushkin, Mark Twain, Chekhov, Maxim Gorky, Sylvester Stallone, and Emir Kusturica were in Odessa. Even Fidel Castro came to visit Odessa! How can you not come to Odessa now? Moreover, Odessa is waiting and we love everybody who comes here.